Live on BBC Radio 5 live, BBC Radio Wales, BBC Radio Cymru and on the BBC website. 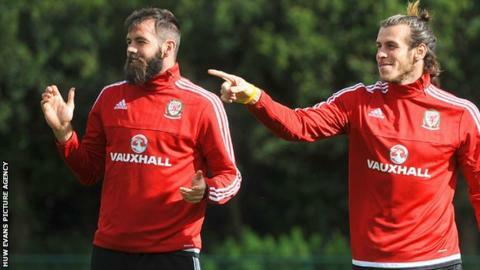 Joe Ledley will miss Wales' crucial Euro 2016 qualifying match with Cyprus. BBC Sport has learned the Crystal Palace midfielder has a hamstring injury, and could be a doubt for the home game against Israel in Sunday. Wales are already without Liverpool midfielder Joe Allen, West Brom defender James Chester and Nottingham Forest's David Vaughan. Wolverhampton Wanderers' Dave Edwards is likely to take Ledley's place in the starting line-up. A win in Nicosia tonight would put Wales on the brink of qualifying for the final stages of a tournament for the first time since 1958. "There's been no official confirmation yet but I understand Joe Ledley is out of tonight's game," said BBC Wales football correspondent Rob Phillips. "His absence will be a huge blow for Wales because he can play that holding midfield role. Chris Coleman is already missing Liverpool's Joe Allen who is out of this game with suspension and out of Sunday's match injured. "The hole created by Ledley's absence is expected to be filled by the Wolves midfielder Dave Edwards, whose last game for his country was in Novi Sad - that 6-1 defeat inflicted by Serbia - but he's always been a reliable performer for Wales. "Jazz Richards, who's left Swansea for Fulham, is expected to be at right wing back, a return on the cards too in that defence for Ben Davies so the Welsh team should be: Wayne Hennessy, winning his 50th cap, Richards, Gunter, Ashley Williams, Davies, Neil Taylor as five across the back. The three in midfield will be Edwards, Andy King and Aaron Ramsey and up front Gareth Bale and Hal Robson Kanu." What else are Wales better at than England? Read more on What else are Wales better at than England?